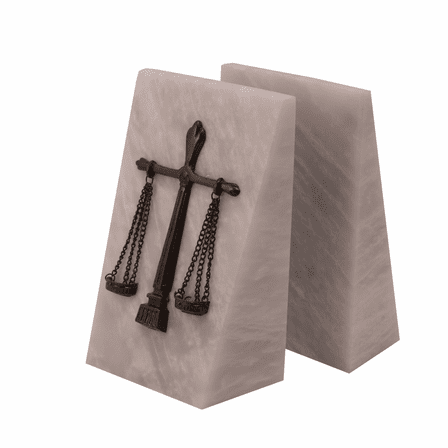 FEATURES/SPECS With their solid white marble constructions and the antique silver plated scales of justice symbol, these handsome bookends will be the perfect finish touch to your law office. The white marble base of each bookend elicits thoughts of a Roman coliseum, the birthplace of justice. The classic look will coordinate perfectly with any motif. 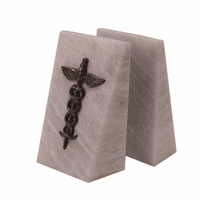 Attached to each bookend in this set of two is an antique silver plated scales of justice symbol, the symbol of our justice system. 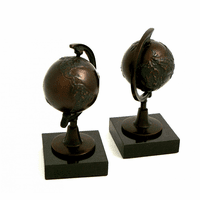 You can personalize each bookend with a laser engraved plate, attached free of charge. 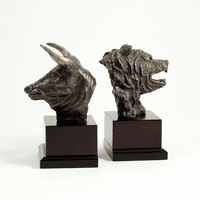 A high end gift for lawyers, paralegals and other legal professionals, these bookends are sure to be a big hit. 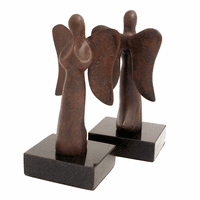 Dimensions: 5" x 2 3/4" x 7 1/2"
Where is the engraving located on the bookends? The engraving is done on a plate, mounted beneath the Scales of Justice emblem. It is added to both bookends.